· Birthday party packages including bowling, arcade games, party host, prizes, invitations, activities on the lanes, kids meal plus lots of fun extras available. Bringing years of experience delivering fun and excitement, let ZONE BOWLING make your child’s birthday party extra special. Our party host will make sure you’ll be able to relax and enjoy the fun of your child’s special day. 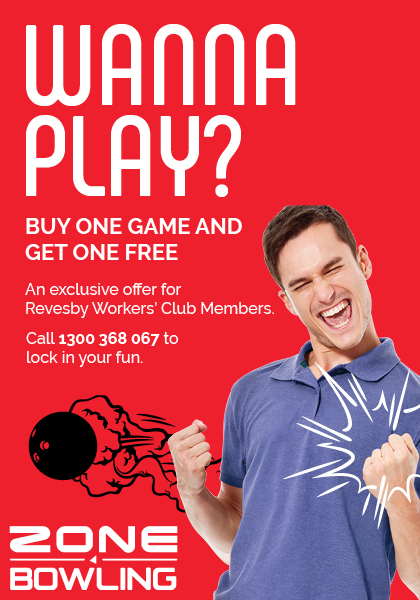 Check out our deals and book online now to guarantee your spot at ZONE BOWLING Revesby. From team building to product launches, conferences or a great night out, ZONE BOWLING has everything you need to create a truly memorable event for your staff, colleagues or friends. With loads of packages to choose from, we’ve got something for everyone. Unlimited free parking at Revesby Workers’ Club car park. Enter via Revesby Workers’ Club (Brett St or Tarro Ave entrance). No access from Revesby Village Centre.